The bride and groom take to the dance floor as family and friends look on with pent up emotion. The first notes strike up and the happy couple begin their first dance as man and wife. This piece is the Re-Deco version of Lovers' waltz, first launched in spring 2010. 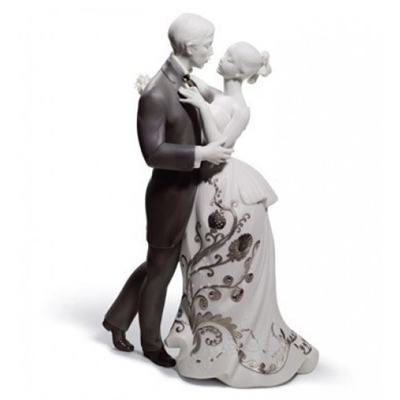 It is inspired by one of the moments all married couples remember with special fondness, the music that accompanies them forever and is still capable of tugging at their heartstrings whenever they hear it. The white porcelain in the bride's dress contrasts with the gray porcelain of the groom's suit. The embroidery and details of her dress are depicted using platinum luster, whose glazed and matte finishes further enhance the ornamentation. Also worth noting is the bride's bouquet, made up of lilies instead of the rosebuds in the original piece.